three air-breathing souls surfing beneath the surface with Grace. This image, “3 Souls Surfing Beneath the Surface”, will be added to the chapter, “…day Four to the East…”. 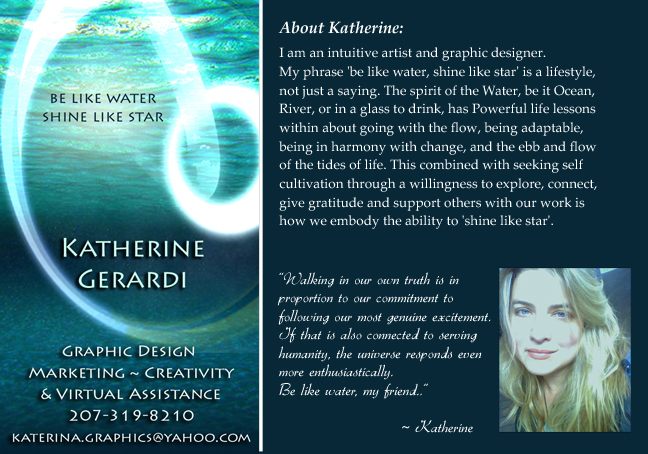 Katherine Gerardi has written a story about her creative process in the Co-Creative Way she is approaching the artwork for “Path of Three Hundred”. Below is what she has written in a Note on the book’s Facebook Page. The story is enlightening to me and I feel compelled to post it here…. Greg has asked me to share some of the back story because the adventure continues even while his boat is in the harbor! As most of you know, the synergy behind the artwork for PO3 has been been a powerful and interesting unfolding and the most recent is no different. The system we have is that Greg sends a drawing he has done, and I graphically expand and create with an intuitive process that guides me along the way. This process has had many surprises because meaningful symbols and details’ I could not have known end up in the artwork which continues to validate that Greg’s journey has been one of profound spiritual beauty. The drawing he most recently sent, was connected to this passage…. Petah felt himself frozen in Time. He was just standing in the cockpit of the Little She staring out over the open sea to the horizon behind him. Waking from this trance, he turned to the rising Sun and welcomed the warmth of the new day on his face. He was getting warmer now. After shedding his night-clothes of many layers, he tethered himself to his safety line and gingerly climbed out of the cockpit onto the deck of his boat moving forward to the bow. The seas were calm and the winds were light-giving the autopilot and easy time to keep the course he desired. Petah lied down on the deck of his Little She and felt the gentle undulation of a sailing vessel on a calm sea. As the Sun rose in the morning cloudless sky, Petah felt a Peace once again. As he lay there, he stared into the blue sky above. He remembered something about the violent day before which was not violent…something beautiful. Yesterday, as the twenty-foot waves would lift his boat high from behind, Petah would turn around and look behind the boat to see what the next wave would be like, making any adjustments to his course necessary to safely steer. One such time, as he turned to look behind, he saw three whales surfing down the face of the on-coming wave. He had been battling the sea for many hours before he had seen this. The Coast Guard aircraft had already departed to the East as he was sailing back West running with the storm in utter exhaustion. The sight of the whales stunned him with their beauty in the midst of all that seemed violent and hellish to the simple sailor. “Those three beings are in their element and probably having a wonderful time…so why shouldn’t I?”, thought Petah yesterday…and now. Normally, I do not receive a passage, just the drawing…but this time, Greg felt drawn to send the passage also…I read it…and began the creative intutive process…My Mind has an idea…. I tried it and it fell short, boring….it did not want to go….Sometimes doing art is like working with a spirited unbroken horse, which does not hesitate to throw one from the saddle…I offered the drawing other angles of Light..curve and Grace…. Without thinking, the intuitive process took over and my hands began to move the image of the Three without thought, totally in the groove…blending color, adding texture, layers…and then energy Shifted. 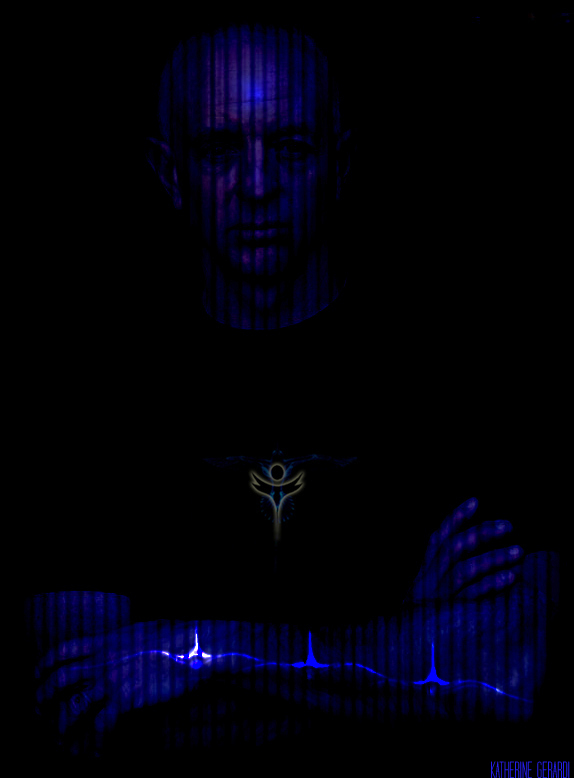 Suddenly…the message of ‘You are Arriving’ ….filled my senses and I leaned back to see what had occurred. I tipped the laptop screen closer to me, and he became more visible…I tipped it back…and he vanished..leaving only the Three…There was one more element that called to be added…and the Longtail Dreaming artwork was pulled up and pasted over Gregs Heart chakra….‘You have Arrived.’ …I hear this and let go…This is not the artwork my Mind could have imagined, but it is exactly what chose to be revealed…This is the way the inuitive process unfolds…I step out of the way, and it becomes what it wants to become. I hope you all enjoy this adventure, as reading this story…now you are along for the journey, too! P.S I recommend tipping your screen back and forward to enjoy the full effects of the ‘ninja’ aspect..and peace. I feel blessed to be one part of this co-creative process of not just two, but three Souls of Artists…Katherine Gerardi, Patricia Roseman and me.